Even when it’s the middle of summer in Vermont, it’s important to think ahead about the snow we’ll eventually have to deal with. 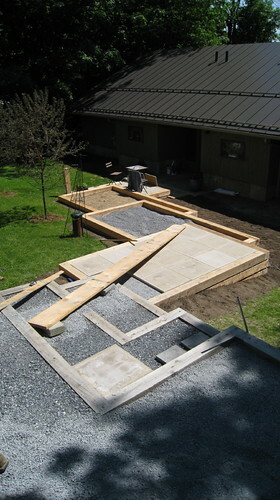 Shoveling a gravel path is a royal pain (as is picking your gravel out of the lawn in the spring), so this summer we decided to put in a whimsical set of stone steps to lead easily to the front entrance. 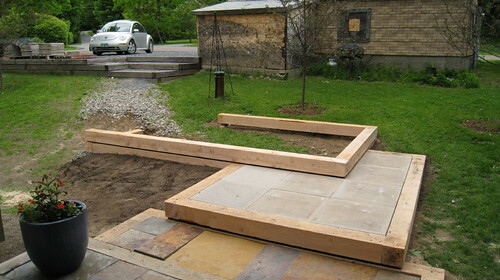 We began by framing the steps with 6″ x 6″ hemlock lumber, the same kind as used in the parking area. 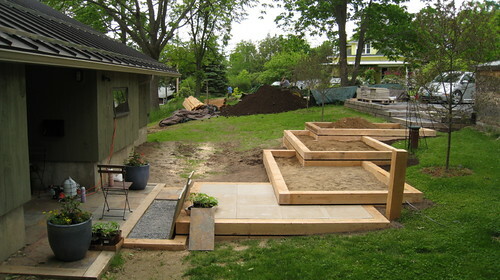 The steps are filled with sand, and then larger gravel, and finally slate and concrete pavers. 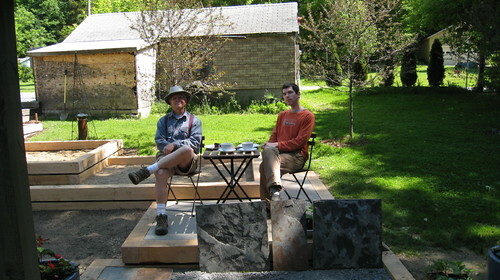 Even the hardest-working eco-builders need a break for tea. 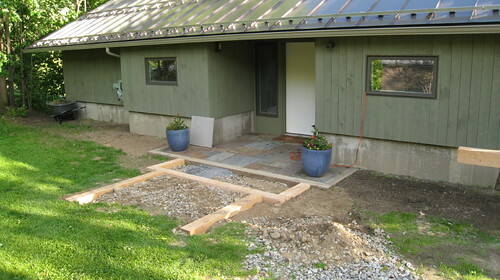 We used the remaining pavers and gravel to add a shovel-able path to either side of the front entrance, which frames the house nicely and helps with water drainage. 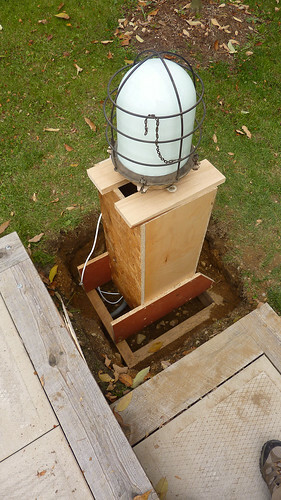 While excavating for the front steps, we also laid down wiring for our outdoor lights. Purchased from an architectural salvage store, and originally from India, these fixtures required nothing more than wiring in to a motion sensor to make them functional. 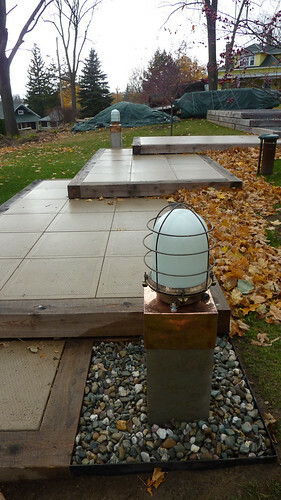 We poured concrete pillars for each light, then added a copper cap on top. 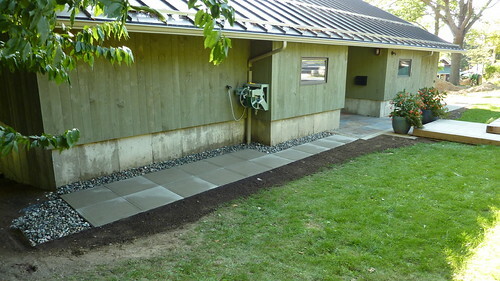 Metal edging and river stone create a clean border at the base. 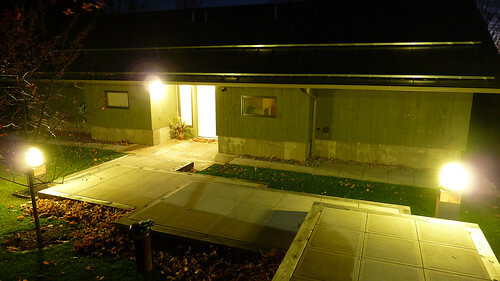 The finished lights do a great job of making the house feel welcoming at night. Love what you’ve done – plan to do something similar to the front of my MCM home! Looks really good… especially those lights. Also, I would be interested in some posts on your utility bills and how the house is performing. You talked so much about it through the process, I’m curious if it is all working as it should or are there any things you would do differently? Looks great! 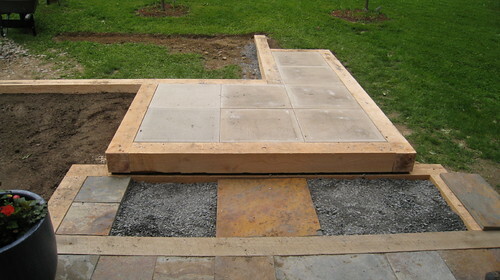 You guys always come up w/ original design ideas — its just a perfect walkway! Fabulous! I stole the whole idea, and now have an amazing front entry too! Thanks for taking the time to post it, smoochies!